"The sea, once it casts its spell, holds you forever in its net of wonder." This is also from Ecola State Park overlooking Haystack Rock on Cannon Beach. The natural framing of the tree seemed to take the picture to the next level. The quote is from Jacques Cousteau although I took the liberty of slightly restating it. Those French say things all funny don't they? The original quote is "The sea, once it casts its spell, holds on in its net of wonder forever." I wonder if I'll catch grief from the short title crowd. Never thought of using a quote before, but I liked this one and couldn't come up with a title for this after some thought. Wow, looks a painting from the group of seven! lovely scene, as from a dream. Message edited by author 2006-01-10 23:57:39. Ah, You beat me at my own game! Glorious image =). Congrats on the top 10! Another gorgeous shot! Congrats doc!! Congrats on the top ten, I'm enjoying the range of your photography, and wondering what's next! these are th kind of landscapes i like. Misty and moody. Awesome picture..Congratulations on your top 10..!! A rare beauty and most loving image. Congratulations on your top ten finish. Congratulations on top 10 and 2nd personal high. This has a good month for you. congrats on the top ten finish, doc! way to go! Top 10 in an amazing challenge - well deserved. This is just captivating. Congrats Doc. Top 10 WOO HOO - that's quite a feather in your cap, considering the competition!!! Though not in colour this image reminds me of the Group of Seven (Canadian painters). Well done. 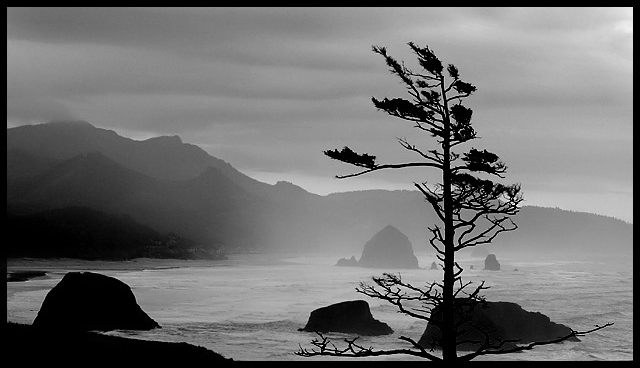 Canon beach is looking good in B/W, well done. That's a pretty long title, but definately a deserving photo. Very nice sillohuettes and layering. Well done! wonderful image..very interesting silhouettes in foreground provide depth and dimension. I know that place. Goonies. Wow, very mystic indeed. Nice shot, good composition. This picture really captures the feeling of either a winter foggy morning or an incoming storm. I love the placement of the tree and the feeling of wind it evokes. Oh wow... very moody image, I can see it framed and on the wall. This is reminiscent of Ansel Adams in my opinion. Great job! There's obviously a truly beautiful photograph to be made at this location. However, this one is not it, I'm afraid. I think that the tree is an intruder obstructing the grander view behind it. The completely black blob at the bottom-left corner weakens the composition too. As for the exposure, and this is only a matter of personal taste, I would have tried to darken the sky a little bit while still retaining some more detail on the foreground rocks by using a soft egded gradual neutral density filter, or certain exposure blending techniques (I believe it's legal in advanced editing to get multiple frames with different exposure adjustments from a single RAW negative and blend them in editing software). Fantastic study in B&W. Reminds me of areas in Pacific North West. Very good job!! This has a nice composition but is flat as a pancake when it comes to tonal range, give it some umph, play with curves and levels, a little. amazing photo, wonderful title, LOVE the black and white. i love the stormyness. 9.... oh heck, a 10! is tree coming from ocean ? Boy, talk about Ansel Adams-esque!!!! Love the single tree silhouette amidst the misty sky. Nice one. Proudly hosted by Sargasso Networks. Current Server Time: 04/20/2019 10:43:31 PM EDT.